Laura McKenna looks at how the use of adjunct professors adversely affects students. From my own experience as an adjunctsee my academic autobiography for the detailsI know that the demands made on adjunct faculty often reduce their effectiveness in the classroom. But this can take many forms. When I was an adjunct, I was fairly well paid and managed to do most of my teaching at a single school. So most of the time I didn't have to dash from one school to the next, but when I did have to teach at more than one school, I was able to take the subway or a commuter train, which allowed me to relax or work as I saw fit. I was always prepared for class and was able to meet with students in my office(s) when they needed to see me. (I was fortunate in that I always had some sort of office space wherever I was teaching.) I even managed to write recommendation letters for students and occasionally was able to improvise a field trip (that sounds odd coming from a former philosophy professor, but it's the best description that I can think of) to the Philadelphia Museum of Art. But as the years of adjunct teaching went on, I often found that I was exhausted. This led to increased illness, among other things. Fortunately for me, I was never seriously ill, but I had to cancel more classes on account of illness as the years went on. And as I became increasingly sleep-deprived, there were a few mornings when I simply couldn't get out of bed, and thus I had to cancel class again. The job search also became more involved, as schools became more demanding in what they wanted applicants to include in their application packages. So my job search tended to take up more time as the years dragged on. I didn't have any choice but to apply for jobs, so I occasionally had to cancel class in order to have time to get my applications in the mail to meet the deadlines. So, I guess, the most direct effect on my students of my being an adjunct was my missing class from time to time as I tried to juggle everything that I had to do. (That is, I missed more classes than I would have if I had been a full-fledged professor.) I'd like to think that I didn't fail my students in any major way during my decade as an adjunct. I worked very hard and did the best I could. I'm just glad that I don't have to work at such a ridiculous pace anymore. Seth Freed Wessler explains how your college professor could be on public assistance. When I was an adjunct professor, I never had to apply for unemployment benefits, food stamps, Medicaid, and the like. Fortunately, I made enough money to pay all of my bills, and even to save a little, but I also never had any of the larger financial obligations that someone of my age at that time would normally take on. So I never bought a house or a car, never got married, never started a family, and so forth. I bought my own health insurance, which I never had to use, since my health at the time was mostly quite good. In short, I never experienced the worst depths of life as an adjunct. Therefore, for the ten years that I was an adjunct, my situation wasn't terrible, but it certainly wasn't what I wanted. By the way, I should add that I never met a single adjunct who wanted to work on a part-time basis. Naturally, there had to some such people somewhere in academia. It's too big for there not to be people seeking part-time employment. But you should always be wary when you see some administrator quoted as saying that many adjuncts want to work part-time. My experience tells me that such a claim is just false. If you aren't already familiar with my blog, then you can go to my academic autobiography to read the story of my years as an adjunct. Book Notes: A Few Thoughts on Philip Sabin's "Simulating War"
From time to time I write a bit of autobiography for this blog. It's time for some more, I think, since I need to provide some background for what I have to say about Professor Philip Sabin's Simulating War: Studying Conflict Through Simulation Games. So sit tight, since it will take me a while to get back to the book. In the mid-1970s I started to play wargames with a friend of mine. He taught me the basics, and then we would sometimes get together to play. Most of the time, though, like many, perhaps most, wargamers, I played solitaire. Even back then, when wargaming faced vastly less competition for a gamer's attention, it was still hard to find an opponent. My gamer friend tended to buy games from Avalon Hill, whereas I tended to buy games from SPI. I soon realized that I enjoyed wargaming enough to subscribe to SPI's house magazine Strategy & Tactics. Because each issue included a complete game on some topic in military history, and because I also ordered directly from the company, I quickly accumulated a lot of games from SPI. It was my good fortune that my first issue of S&T contained Panzergruppe Guderian, which was easily my favorite of all the games that I received during my years as a subscriber. It was also my misfortune, since the high quality of PGG spoiled me. Most of the subsequent games were not nearly as good, and a few were fairly dreadful. I'm still having nightmares about Armada, an unplayable game that should never have been sent to subscribers. Magazine wargames are still sometimes hastily rushed out the door, and so their reputation for being underdeveloped, which they acquired in the glory days of S&T, lives on. I more or less stopped wargaming after I graduated from high school. My games stayed at home when I went away to college, but I pulled one off the shelf now and then when I went back home to visit my parents. Otherwise, though, I didn't make any effort whatsoever to keep up with new developments in wargaming for roughly thirty years. About three years ago, however, I started to get back into it. If you've looked my autobiographical posts or my academic autobiography, you've seen that I've had problems with my back and right shoulder for several years. Fortunately, I've gotten better, but I still have to ration my time in front of the computer. That characteristic typing position — you know what I mean, the one that involves having your elbows at your sides and your hands over the keyboard — seems to be what most aggravates my pinched ulnar nerve. That's why I've had to cut back on blogging the last few years, and, just in general, the progress of my scholarly work has slowed as a result of this pinched nerve. But, fortunately, as I said, I'm feeling better these days. Anyway, it's still a good idea for me not to spend too much time in front of the computer. (So, to tell you the truth, I really ought not to be writing this post. But we don't always do what we should, do we? This may or may not be to your advantage, depending upon whether I have something of interest to say about Prof. Sabin's book below.) I was thinking about this in early 2010, trying to figure out what to do about it. I cut back on my blogging and my reading of news and current events. I was never much of a computer gamer, which meant that there wasn't much computer time to be saved there, but I stopped playing the occasional game of Klondike. I also reduced the amount of email that I send. And so forth. (If you're reading this post, then you probably spend too much time at your computer as well. Therefore, you don't need me to recite all the ways in which you could reduce your dependence upon it.) I wanted something else to do away from the computer besides reading books, listening to music, and watching movies. I've been doing those things for years. So what else was there? That was when I started wargaming again. It's true that I play a few boardgames, but, really, I enjoy wargames more, especially since they tend to be better suited to solitaire play. Because I'm no longer an academic philosopher, I no longer have to read as widely as I did when I was teaching my many different classes. So I've reduced the size of my philosophy library and greatly increased my holdings in history. I've long been an avid reader of military history, and so my renewed wargaming nicely dovetails with my steady consumption of books on military history. I'm currently writing a commentary on Max Horkheimer and Theodor Adorno's Dialectic of Enlightenment, which, since it was written during the dark days of the Third Reich, takes on the topic of fascism. So my reading about Nazi Germany even fits in with my interest in wargaming. The basic point of the preceding paragraphs — and this is why all of this autobiography is relevant to my discussion of Prof. Sabin's book — is that I have a fair amount of personal experience of wargaming. (Yes, my involvement has been somewhat episodic and thus scattered over time, but it continues to this day.) More important, though, is that my interest in wargaming has never been driven primarily by a passion for gaming, but rather by a lifelong fascination with history. (This, by the way, is why boardgames have never interested me as much as wargames.) Wargames are games, of course, but I've never regarded them as just games. I've always seen them as vehicles for historical understanding. Of course, they need to be entertaining (and thus their primary duty is to entertain), but they can be much more when they are sufficiently ambitious, properly researched, and carefully designed. Okay, enough background information about me. Now on to my discussion of Prof. Sabin's book. The most remarkable thing about Prof. Sabin's book is that it exists. Really, it's that simple. That an accomplished academic has written a book about an activity that some people are certain to dismiss as childish is quite a step forward in the intellectual appreciation of wargaming. Not only does the book discuss wargaming in a serious (which is not to say a solemn) manner, it even contains games that the reader can build and play (or download from Prof. Sabin's website and then build and play). A scholarly book with games in it! Gasp! 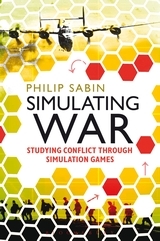 So we should just take a moment to appreciate the mere fact of the publication of Prof. Sabin's Simulating War: Studying Conflict Through Simulation Games. (And while we're at it, we should also applaud Continuum Books for deciding to publish the book. Too many academic publishers are given to following the latest academic fashion, rather than searching for innovative projects and fields of study to promote.) It's just nice to be able to read such a book. The book consists of three parts: theory, mechanics, and examples. For my money, the most interesting part is the first one devoted to the theory of wargaming. I was especially intrigued by Prof. Sabin's tales of how he has used relatively simple wargames in his classes in the Department of War Studies at King's College London. The opening sentence of chapter 3 deftly summarizes his vision of the educational utility of wargaming: "The most important function of wargames is to convey a vicarious understanding of some of the strategic and tactical dynamics associated with real military operations" (31). In the classroom this precept, he argues, requires for its realization small conflict simulations that can be easily learned and quickly played. (The phrase "conflict simulation" is often used as a synonym for wargames, especially the ones that strive to model some historical conflict as accurately as possible. Wargamers routinely debate the extent to which a particular wargame simulates the historical contest that gives the game its theme and guides its design. Also, sad to say, the phrase is sometimes employed to avoid embarrassment or so-called "game shame" on the part of wargamers. It's sort of like saying "film" or "cinema" instead of "the movies". )The first color photo in the book, immediately after page 72, shows groups of his students playing a simulation of his own design. Students quickly learn to appreciate the complexities of military operations, because, Prof. Sabin writes, they "must grapple with real strategic and tactical dilemmas as they struggle to beat their colleagues" (37). The element of struggle is extremely important and not fully grasped by attending lectures and reading textbooks. Real warfare, after all, isn't a thought experiment or an intellectual exercise. It is a contest in which opposing sides typically pay a high price for participating, especially the loser. The players of a wargame attempt to beat each other in a manner similar to that of real combatants, and they do so in the full knowledge that something important, as defined in the victory conditions of the game, hangs on the outcome. Real military contests, thankfully, happen only once, but wargames give us the opportunity first to simulate some particular conflict and then to replay it again and again. As Prof. Sabin writes in his book's most incisive sentence, "Wargames bestow in miniature the almost God-like ability to rewind time over and over again and to experiment with all kinds of random variations and alternative decisions, thereby creating the ultimate counterfactual sandbox" (55). When I was first playing wargames as a teenager, I certainly didn't know the word 'counterfactual', but no less certainly did I appreciate this aspect of wargaming. (So, by the way, do wargame publishers. Their advertising often challenges potential purchasers to change history.) This is one of the things that always fascinated me about the best conflict simulations. Prof. Sabin's discussion of game mechanics will probably be of less interest to those who are already oldhands at wargaming, and those who are just beginning to take up wargaming will probably find it somewhat bewildering. He covers typical wargame mechanics, e.g., hexagon map grids, zones of control, stacking limits, and the like, as well as how designers attempt to simulate combat and command in different periods of history. Much of this was already familiar to me, of course, but I appreciated the ways in which Prof. Sabin articulated how these design choices can be brought together to create individual war-games. Prof. Sabin then provides his readers with eight simple games of his own design. They make use of the techniques described earlier in the book, and thus give his readers an opportunity to see his design principles in action. I have to admit that I have yet to play any of these games. They look like good games, but, of course, I can't know for sure without playing them. I would have liked to have seen more on two particular topics. In the book's introduction Prof. Sabin talks about military gaming, that is, the tradition of Kriegsspiel that began in the early 19th century. Since I'm not a military professional, and since I've never read much about this type of gaming, which I assume is quite different from the largely commercial, hobby wargaming that Prof. Sabin discusses, I'm in the dark as to how the wargaming I know differs from what military professionals have been doing for two hundred years. That's just my ignorance, of course. But I think that Prof. Sabin's book would be even better if it not only said more about this difference but also illustrated it in some appropriate fashion. The second topic that could have used more discussion is that of the morality of wargaming. Prof. Sabin discusses this briefly on pages 161 to 163. What I would like to see discussed is whether or not there are moral restraints on what aspects of a military conflict a designer should seek to simulate. Should, for example, the genocidal aspect of Nazi Germany's war against the Soviet Union be simulated? There are many, many wargames that simulate the German invasion of the Soviet Union, but as far as I know, none of them attempt to model the Einsatzgruppen and concentration camps that followed in the wake of the Wehrmacht's advance. This aspect of the historical conflict was hardly an afterthought. It was a key component of Nazi ideology, yet it is hard to imagine that someone will ever design a game that simulates the Holocaust and makes it a major element of the German war effort. Maybe there is such a game, and I'm just not aware of it. I certainly hope that there is no such wargame, but is this just squeamishness on my part, or is it grounded in some sort of moral objection? I would be interested to read what Prof. Sabin has to say on this topic. As of this writing, I have no clear thoughts on the matter. As you can see, I have a very favorable opinion of Prof. Sabin's book. If you're interested in wargaming as an intellectual activity that goes beyond merely having fun playing games based on military history, then I recommend Simulating War: Studying Conflict Through Simulation Games to your attention. I haven't blogged much for the past couple of years, but I intend to change that. If you go to my academic autobiography, you'll see that I've had some health issues that have gotten in the way of my work in general, and not just my blogging. But I've been feeling better recently, and so I should be doing more with my blog from now on. At least that's my hope. Since late 2008 I've been having trouble with a pinched nerve in my back. Consequently, when I completely finished one big project in February 2010 and then finished the hardest part of the work on another big project a few weeks later, I decided to take time off from working at my computer. As a result, I haven't been blogging much in recent months. Fortunately, my back is getting better, and so I hope to return to more regular blogging later this year. One of my former students from my years at the University of Pennsylvania recently directed my attention to this article by Thomas H. Benton. Mr. Benton (who is actually an English professor named William Pannapacker) has this simple advice for anyone who is thinking about going to graduate school in the humanities: just don't go. My former student says that Prof. Pannapacker's reasoning in support of his advice sounds very much like what I told her when she was considering becoming a graduate student in English. So she wanted to be sure that I read this particular article. I find myself in complete agreement with Prof. Pannapacker's views. This post on my blog will give you a few of my thoughts on the subject of graduate school. You might also want to read my academic autobiography. I haven't updated it in over three years, but it amply covers my ten-year experience as an adjunct. (Yes, ten years.) My example should serve as a warning to anyone thinking about graduate school in the humanities. Oh, one last thing. As you read Prof. Pannapacker's article, you'll come across a reference to the infamous Bowen/Sosa report. I say something about this laughable piece of scholarship in this post. I've gotten into the habit of posting an autobiographical entry to mark the anniversary of my return to Texas. This year is no exception. For those of you who don't already know, I flew back to Texas on June 21, 2003. If you aren't familiar with the story, then you can look at my academic autobiography. It will explain why I left Philadelphia after seventeen years and returned to Denton. My earlier autobiographical posts tell the story as well. The previous two anniversary posts concentrated on my academic writing and my efforts to get settled back in Texas. The latter mostly consisted of my dealing with the house that I inherited from my parents. Fortunately, the work on the house was completed well over a year ago. Consequently, this time around I won't need to write about the many renovations that took up so much of my time in the past. Towards the end of 2005 the Fichte chapter that I described in last year's post, i.e., the introductory piece on Johann Gottlieb Fichte's Foundations of the Entire Wissenschaftslehre, appeared in volume 3 of Central Works of Philosophy. The series is edited by John Shand and published by Acumen Publishing. I have to confess that I caused to the volume to appear later than the publisher had planned. Because I was so overwhelmed by work and the house, and because I had hurt a tendon in my right hand in the summer of 2004, I fell behind on my chapter. Both editor and publisher were patient, and so by early 2005 I had managed to complete my contribution. It turned out fairly well, I think. It's a good place to begin to understand Fichte's philosophy, if I do say so myself. Another overdue project appeared in 2005. Many years ago Paul Guyer, Fred Rauscher, and I began work on what would eventually be published as volume 13 of The Cambridge Edition of the Works of Immanuel Kant in Translation. This time, though, I was way ahead of everyone else! My collaborators were the ones who had to catch up, because I had finished my translations in 1999. Things were in a bit of a lull in the summer of 2005. The Fichte chapter was done, and I decided to take some time off to work in the yard. (Oh, how I miss Philadelphia! Everything green belongs to the city!) I also decided to delay resuming work on the translations that I've been preparing for a volume on Fichte and the atheism dispute that Yolanda Estes and I started years ago. It seemed to me that I should instead begin to make good on some plans that had been on hold for a while. If you look at my CV, you'll see that the philosophy of art is one of my academic interests. For several years I'd been thinking about taking music lessons. There are any number of ways in which a technical knowledge of music could fit into my future writing and translation projects. For example, I might begin to write about Theodor Adorno's views on music. The thought is hardly far-fetched. As I write this post, I'm in the middle of writing a proposal for a book on Dialectic of Enlightenment, a book that Adorno co-wrote with Max Horkheimer in the early 1940s. In the future I could easily branch out into Adorno's aesthetics of music. I've also given some thought to re-translating some of Richard Wagner's prose writings. Doing so would require some technical knowledge of music. Besides any possible academic use that I might have for a technical knowledge of music, I thought that I should just do something entirely new to me. My current situation as an independent scholar gives me the opportunity to do things that I've never done before. So I started taking piano lessons at the end of August 2005. I'm no musical genius, but I've been making progress. That same August I started going to a gun range in Dallas to do some shooting. I've always been interested in military history, but I've never really known much about guns. I inherited several from my father when he died in 2002. I kept them, of course, although I didn't know much about how to use them. When I moved back to Texas in 2003, I started to do some on-line research to determine whether any of them were of any value. I figured that they wouldn't be worth much, and my research confirmed my suspicions. As I looked into the matter, however, I thought that I should learn about them. A little carnage to go with my culture, you might say. It would be something else entirely new to me. So I signed up for a class, learned the basics, and started going to the range once or twice a month. I'll have more to say about this in future posts. Towards the end of 2005 I resumed work on the Fichte translations. They're my main academic project for the next year or so. I hope to have my portion completed by this time next year, but, unfortunately, it will probably take longer than that. In late 2005 horror film maven Steven Schneider contacted me again, this time about contributing an entry or two to a European horror film guide that he is editing for the British Film Institue. I chose to write an entry on Häxan, a thoroughly odd, but fascinating, Danish silent film from 1922. I wrote a 500-word entry by the end of March 2006. The book hasn't appeared yet. More on it when it appears. A few weeks ago I noticed that Thoemmes Continuum had published a paperback edition of my three-volume Winckelmann set, which originally appeared in hardback in 2001. I say "noticed" because no one at the press had contacted me. I stumbled across the new edition while I was looking up some information on-line. Not being notified was a bit annoying, as you can easily imagine, but I'm glad that the set is available in paperback. I corresponded with the press, and I was quickly sent my complimentary copies of the paperback edition. As I mentioned above, I'm working on a proposal for a commentary on Horkheimer and Adorno's Dialectic of Enlightenment. I've been at it for a while, but only now have I really been able to do the serious writing. I'll soon have a draft, which I'll send to an editor who has expressed an interest in the project. If I get a contract after the usual review process, then I'll have two book projects, this one and the Fichte translations, to keep me busy. So I seem to have come to terms with being an independent scholar who is no longer pursuing a career as a professor. At least for now I'm content to remain in Texas. I don't really see any compelling reason to attempt to return to academia. Besides, that whole guns thing would probably cause me problems at some schools, I reckon.